On September 18, 1923, Princess Anne Antoinette Francois Charlotte of Bourbon-Parma was born in Paris, France. Like most European royalty she was relatively closely related to many reining or former monarchs, but more directly she was the second child of Prince Rene of Bourbon-Parma and princess Margrethe of Demark. 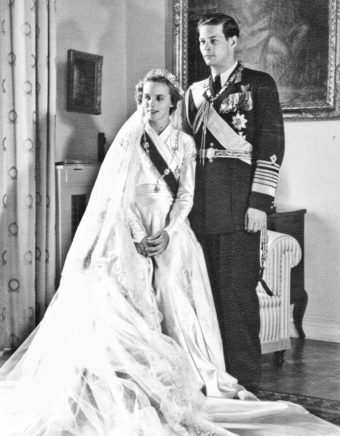 She spent her early years with her parents and three brothers in France, but with tensions rapidly escalating between France and Germany and war imminent, the then 16 year old princess and her family headed for Spain in 1939 and, not long after, left Europe altogether, bound for America. The family settled in New York where Anne attended school until she was 18 and then went on to attend Parson’s School of Design where she managed to complete the three years of course work in just two years. At the same time, in order to pay for her schooling, she took a job as a sales assistant at the Herald Square Macy’s department story in New York (which, by the way, is still there), as well as later working at Bloomingdale’s and at her mother’s hat shop on the side. However, with war raging in Europe and not happy just sitting on the sidelines, in 1943 she joined the French as an ambulance driver and nurse. Over the course of the war she served in Algeria, Morocco, Italy, Luxembourg, and Germany itself, during which she was promoted to the rank of lieutenant and awarded the French Croix de Guerre, which is given to individuals who distinguish themselves via heroic or otherwise exemplary deeds worthy of special merit. But the princess was not to remain such. She would soon be Queen, in part thanks to her time serving in Morocco. Anne met her future husband and second cousin, once removed, King Michael I of Romania thanks to the nuptials of England’s Princess Elizabeth (now Queen Elizabeth II) to Prince Philip of Greece in 1947. Michael’s mother had been plotting behind the scenes for some time to secure a meeting between her son and the Bourbon princess, but up until that point without any luck at bringing the two together. It would seem the handsome young King had spotted Anne while watching a movie in the Royal Palace cinema hall. The princess was not there, nor herself ever an actress. So how did he see her? Before the movie there was a news real showing footage of the war, in this case specifically some footage from Morocco. In that footage was a few second clip of Princess Anne. Infatuated with her, the young King had a small photograph made from the film reel of the princess which he kept. At some point, he seems to have clued his mother in on his choice of bride and the wheels were in motion. When informed of the potential, Anne wasn’t averse to the idea, but didn’t want their first meeting to take place under the microscope of an official event like a royal wedding, so initially declined invitation to the wedding. You see, unlike many other royalty who lived a rather more posh lifestyle, including the King, she wasn’t confident in her abilities with the social etiquette side of such royal events. But fate, or more likely the pair’s parents, had other ideas. She was persuaded to come to London by her cousin, Prince Jean of Luxembourg, and when she arrived and popped by to see her parents at the hotel they were staying at, King Michael just so happened to be calling as well at the same time. This turn of events threw Anne off so badly that instead of curtsying to the King, she clicked her heels in salute. This lack of royal grace and subtle awkwardness, however, seemed to only make the King even more interested in the unorthodox princess, and they began to spend chaperoned time together while in England. An avid aviation enthusiast and pilot, he later invited her to come fly with him on a little trip to Switzerland in which he was taking his aunt, the Duchess of Aosta, Princess Irene, home. From there the couple were almost inseparable, culminating in the King asking her to marry him on day 16 after their clicking heals get together. She declined… But soon after changed her mind. They did, however, apparently allow him to leave the country with a small number of valuables and some of his entourage. The fact that the King was no longer such, nor had much in the way of resources anymore, did not deter the princess and plans for their wedding continued. There was another problem though. You see, Anne was Catholic, and to receive a dispensation from the Pope to marry a non-Catholic, it was required that they promise that any offspring would be raised Catholic. This was something that King Michael could not do, owing to stipulations in the Romanian Constitution of 1923. While he was no longer technically King, he had to consider the possibility of he or his offspring being restored to the throne. Had he agreed to the Church’s terms here, any chance of that ever happening would have gone out the window. 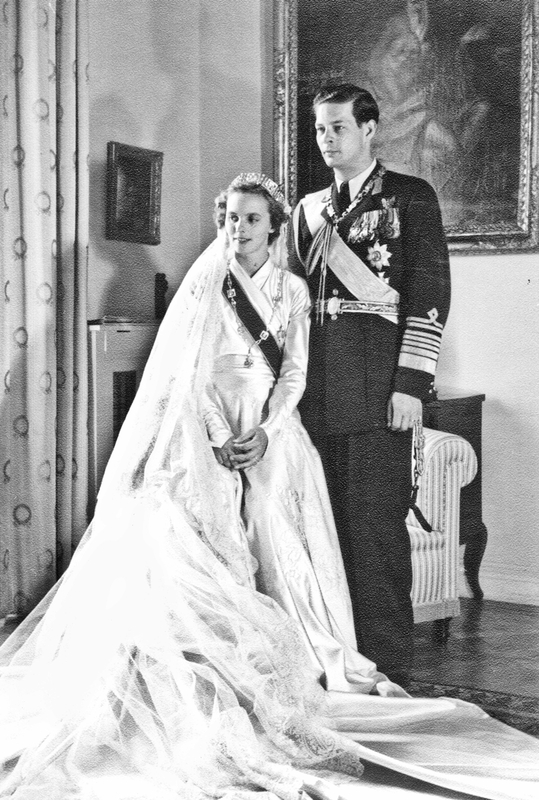 The refusal of the Pope to give them permission to marry also didn’t matter to the princess and on June 10, 1948, they married in the Royal Palace in Athens, Greece. In retribution for this act, Anne was forbidden from taking communion at any Catholic Church by official Vatican decree. The Church also refused to acknowledge the marriage, though almost two decades later they would relent and allow the pair to marry once again, on November 9, 1966, this time in a Catholic Church. Despite her husband having been forcibly ousted from his monarchy, Anne nonetheless became known as Her Majesty Queen Anne of Romania, though she was never technically crowned. Lacking a throne and having few resources, the apparently happy couple settled into a relatively quiet life, even at one point rather humbly running a chicken farm together. The Queen also took up carpentry, specializing in furniture, but also at least in one case took on bigger projects, like constructing a workshop, building and all, for the King. Also on the side she made money by selling some of her art, and, breaking even more stereotypes of her era, apparently was an avid hunter and off-road enthusiast. As for King, besides the aforementioned chicken farm, he also worked a variety of other jobs, including test pilot and stock broker. In all the couple spent approximately five decades in exile and had five daughters in the interim. In the late 1990s, they were finally able to return to Romania together and the King was even given some of his properties back, including the magnificent Savarsin and Peles Castles. In fact, at one point there was even strong talk of the King running for President, but he declined. Nor did he ever overtly seek to recover his throne despite his popularity, stating. Romanians have had enough suffering imposed on them to have the right to be consulted on their future. Ultimately the couple were married for 68 years until the death of Queen Anne in 2016, dying at the ripe old age of 92. The King would follow her the next year, dying at the age of 96 in 2017.